Plants use resources, i.e. carbon, nutrients, water and energy, either for growth or to defend themselves from biotic and abiotic stresses. 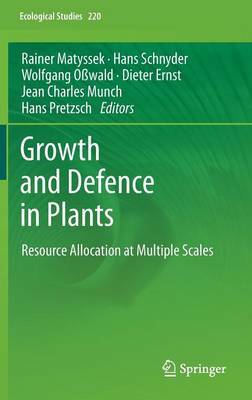 This volume provides a timely understanding of resource allocation and its regulation in plants, linking the molecular with biochemical and physiological-level processes. Ecological scenarios covered include competitors, pathogens, herbivores, mycorrhizae, soil microorganisms, carbon dioxide/ozone regimes, nitrogen and light availabilities. The validity of the "Growth-Differentiation Balance Hypothesis" is examined and novel theoretical concepts and approaches to modelling plant resource allocation are discussed. The results presented can be applied in plant breeding and engineering, as well as in resource-efficient stand management in agriculture and forestry.